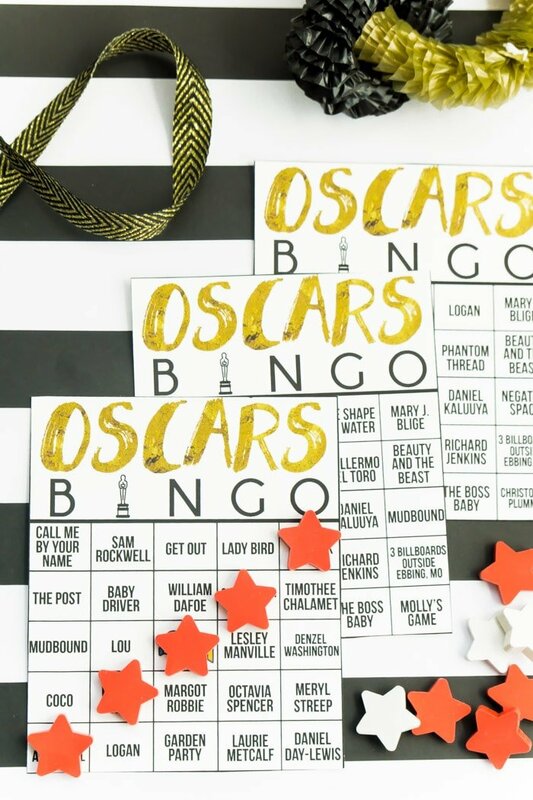 Use these free printable Oscars bingo cards to keep everyone entertained at your Oscars viewing party. 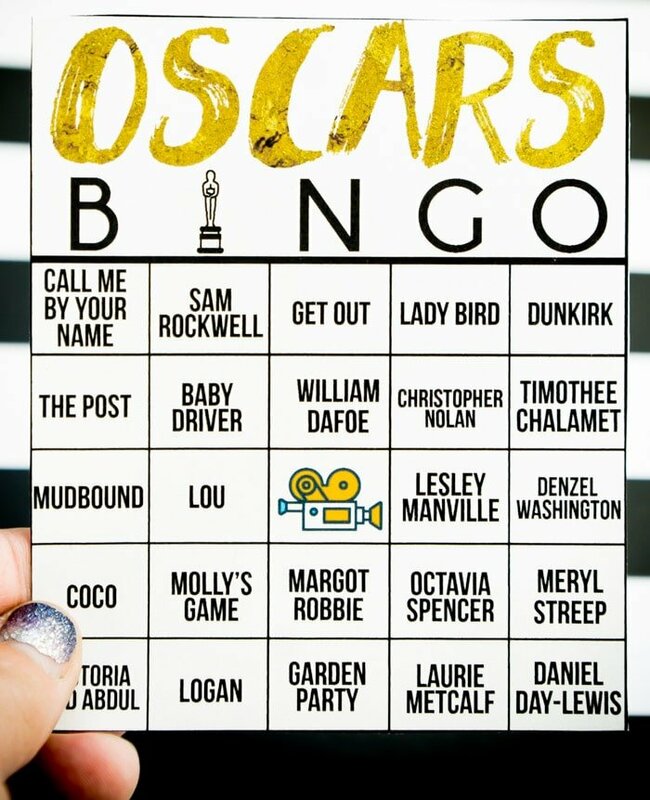 Or print them out for yourself and play along even if you’re not having an Oscars party! 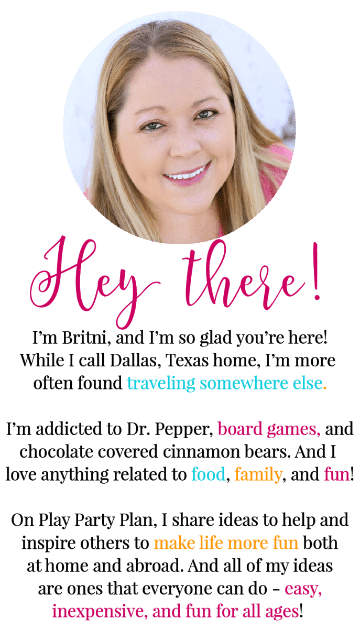 This post contains affiliate links to products to make your party even better! Can you believe it’s already time to get parties prepped for this year’s big night? I’ll be the first one to admit that I haven’t seen all of the best picture nominees this year, but I have seen a handful of them, and it was definitely a good year for movies! 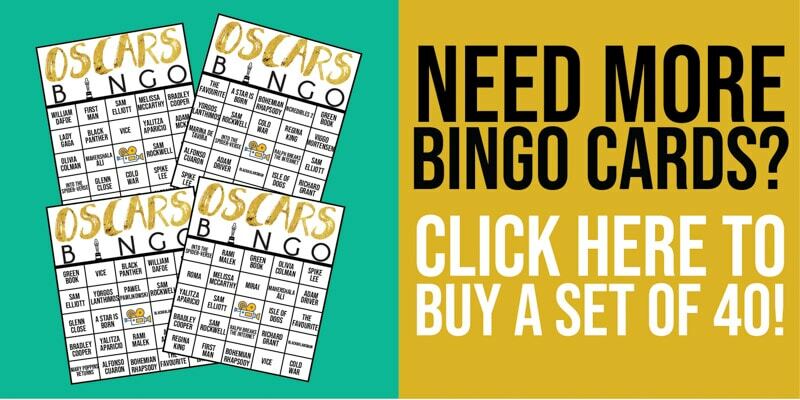 One quick note – the Oscar bingo cards HAVE been updated for the 2019 nominees, but the majority of the photos in this post are still from last year’s awards. I didn’t see the need to redo all of the photos. Cards look exactly the same with the new nominees! Tons of great musical themed movies plus a huge ground-breaking achievement for the first Marvel movie to be nominated for a best picture award. I love watching the Oscars either on my own, with my family, or with girlfriends who come over! 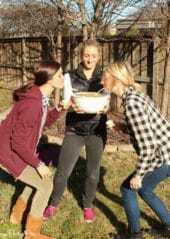 This year we’re going low key but if you’re hosting an Oscar party, make sure to check out these Oscar party ideas! They’re perfect for this year’s big night! I created these Oscar bingo cards specifically for this year’s big event with the nominees from the major categories as well as a couple of my favorite categories like best musical score and best animated feature! There are three different ways you can play this Oscar bingo game. First, you can have people cover up the spaces when the celebrity or movie is mentioned/shown on camera. Second, you can have people only cover up the space when a celebrity or movie is actually mentioned as part of an awards nomination – e.g., the nominees for Best Picture are XYZ. And third, you can have people only cover up the spaces when that celebrity or movie actually wins an Oscar. If you’re doing the latter version of the game, make sure people know ahead of time so they can choose their card based on who they think is going to win. It definitely makes things trickier and more fun! One caveat to version #3 – it’s possible that no one will bingo depending on who wins. If that’s the case, figure out how you’re going to determine a winner or just put all the cards in a bowl and pull out a random winner at the end of the night. One other note – I didn’t put the names and movies on the cards in any order, so it’s possible that none of the best actor nominees for instance are on one given card! Decide which way you want to play and tell your guests. Let people choose their cards (or just hand them out if that’s easier) and give them markers like candy stars to cover up spaces when it’s time. The first person to get five in a row horizontal, vertical, or diagonal wins! Don’t forget to get Oscar themed prizes for your winners! These are some of the things that people have loved most in the past when we’ve played. You could even do a combination of say a gold statue with a gift card! I’ve created 16 totally unique Oscar bingo cards for you to print and use. Need more than 16 cards, I’ve also created a set of 40 unique cards you can buy here or by clicking the image below. 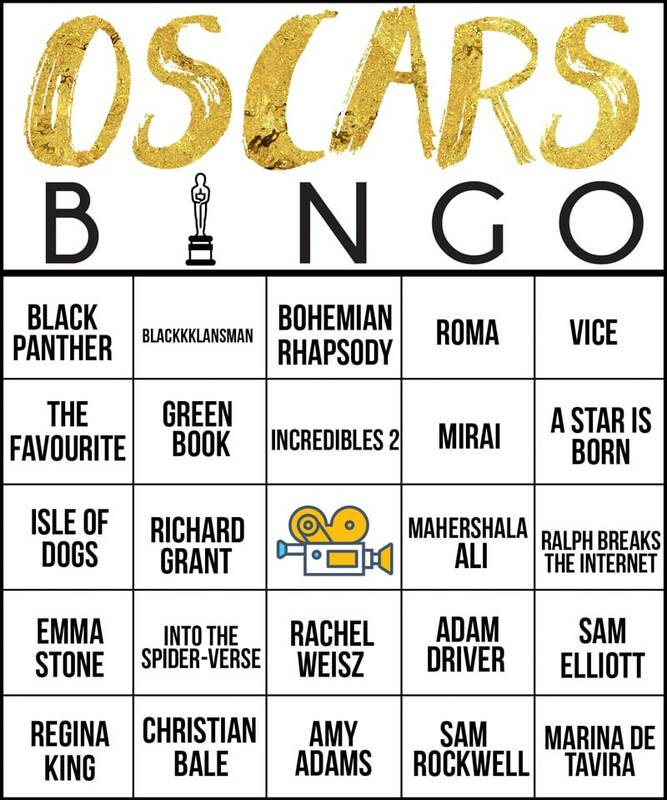 Don’t forget to pin these Oscar bingo cards for later! Make sure to check out these other awesome Oscars inspired ideas from some of my favorite blogger friends! 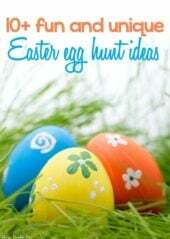 Click on the link to be taken directly to the posts! 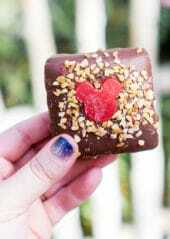 Hello ~ . are you doing updated cards for 2017 please?? I am Jenn, they’ll be up early next week! Please send me this tears Oscar bingo cards!! Still no updated bingo cards? Can we have a status. So sorry Mendy, I posted the new cards earlier this week. 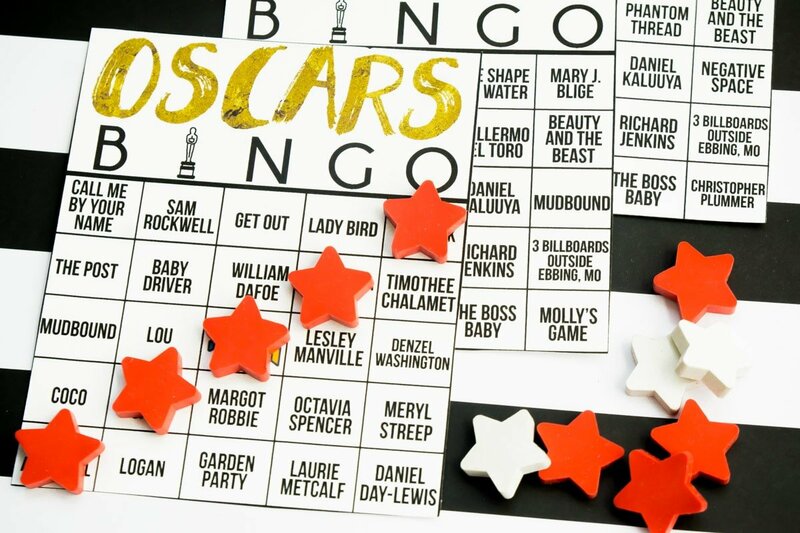 You can find them over here –> http://www.playpartyplan.com/oscar-party-ideas-oscar-night-bingo-cards/.